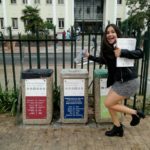 The recycling system at Stellenbosch University (SU) is a complex animal, and many students don’t know where their cast-away coffee cups, food containers and plastic bottles end up. There are, however, statistics to answer these questions. About 40%, or 41 496kg, of the total waste that passed through the SU main campus during Feb ruary 2019 was “recovered”. This is from a total amount of 103 093kg of waste produced by the campus. This statistic takes on quite a serious air if it is considered that only 16% of that total amount was recycled material, with the remaining 24% being so-called “organic waste”. During February, approximately 61 tonnes of waste produced (60% of the total) went straight to the landfill. Waste produced on campus is gathered from various collection points situated on and around campus by WastePlan, a South African company specialising in commercial and industrial waste management and recycling services. This waste is mainly collected via the three-bin system, where clear bags are used for recyclable materials, black bags for non-recyclables and green bags for food waste and composting. From here the bags are taken to WastePlan’s Stellenbosch Main Recovery Facility (MRF) and organic/food waste is sent to Agri-Protein, where it is used for fly larvae farming. At the MRF, all bags are opened and further sorted through. Although black bags are destined for the landfill, they are searched for any salvageable recyclables. It is here that the SU recycling system runs into a considerable hiccup. by Wentzel were “contaminated”, which meant that all possible recyclables contained therein were rendered unrecyclable, due to the mixing of food waste and other substances like coffee with the recyclable materials in the bag. According to Wentzel this is the case with most “recyclable” bags. He added that coffee cups are especially problematic in these cases. A simple coffee cup spilling leftover coffee over recyclable material is enough to render a bag contaminated and unfit for recycling by MRF. Contaminated bags are sent to the landfill along with black bags. Some recyclables are salvaged from contaminated bags, but Wentzel said that these were mostly plastics and cans. Official spreadsheets provided to Die Matie by Thulani Mhlontlo, WastePlan National Data Supervisor, show that the percentage of general waste sent to landfill was especially high during the months of August, September, October and November of last year, a peak time in campus activity. In August last year, the percentage of total waste sent to landfill was 64%, followed by 61% in September, 71% in October and 72% in November. The average total amount of waste documented for these months was 114 704kg per month. A landfill site just outside of Stellenbosch is used. It is however, set to close in two years when it fills to its maximum waste capacity. According to John de Wet, Manager: Environmental Sustainability at Facilities Management, the closing of the landfill could pose a potential problem. According to De Wet, this is one of the reasons why Facilities Management has set the goal to reach a stage where all waste is sorted, with 80% being recycled and only 20% going to the landfill. He added that Facilities Management wants to reduce the impact on the environment as well. Dannica Pedro, who works in the Sustainability Department at Facilities Management, said that waste on campus, firstly, must be reduced.